US actor Brent Hill studied the violin for seven years during his childhood. "But, now, I couldn't make a sound out of it," he says, laughing. His latest role as Dewey Finn in Andrew Lloyd Webber's musical, School of Rock, in which he plays with 36 talented child musicians, reminds him of his time as an instrumentalist. Hill shared his story when he arrived in Beijing on March 20. 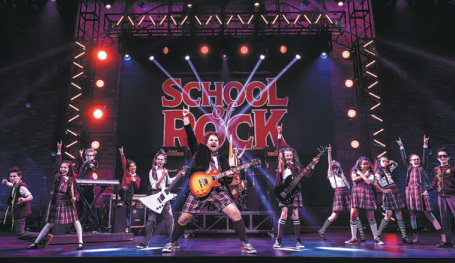 After four weeks of performing in Shanghai, School of Rock is being staged in the capital at Tianqiao Performing Arts Center from March 22 until April 14 on its debut China tour. It'll visit other Chinese cities, including Suzhou in Jiangsu province, Guangzhou in Guangdong province and Xiamen in Fujian province this year. The musical is based on the successful 2003 Hollywood comedy, starring Jack Black. The plot follows Dewey Finn, a failed rock star forced to make money as a substitute teacher at a private elementary school, where he turns a class of straight-A students into a rock band. "The role, Dewey, is the biggest kid. I am a big kid in real life, so this part is not a challenge. When I got the role, I did the exact same thing as Dewey... who is a loser. I stopped paying my rent for a couple of months to see what happened," Hill says. "Working with child actors is exciting." Thousands of kids auditioned. Three-and-a-half months later, 36 made the cut. Samantha Zhang plays the role of Katie. She has practiced piano for seven years and violin for four but had to learn to play bass for the musical. "Not many girls play bass. It's so cool, and I feel like a rock star," says the 13-year-old, who made her musical-theater debut in Opera Australia's The King& I in 2014. It's the first time for the girl, who lives in Sydney with her Chinese parents, to visit China. Webber, who's known for such musical-theater hits as Cats and The Phantom of the Opera, became interested in the movie after his wife, Madeleine Gurdon, recommended it to him. The musical staged its world premiere on Broadway in 2015. It made its West End debut a year later. And it toured Australia for three months before coming to China. The movie includes songs by such celebrated artists as David Bowie, Metallica and The Clash. Webber also wrote 12 new songs, that feature alongside songs like Teachers' Pet and Stick It To The Man, which appeared in the original movie. "Webber knows rock well," Hill says. "The music is about getting something out, like your anger or a demon. For the musical, it's also about the spirit of community." Hill has watched the movie over 20 times. But he says it's difficult to get Black's acting out of his subconscious. However, Webber's songs make the musical fundamentally different, enabling Hill to make the role his own. "School of Rock is about how music reaches and transforms everyone's life, especially children," Webber said at the 70th Tony Award ceremony in 2016, where School of Rock was nominated for four awards, including Best Musical, Best Score, Best Book and Best Leading Actor in a Musical. "When the substitute teacher turned the straight-A student class into a rock band, it changed his life and theirs forever." Andrew Lloyd Webber's musical, School of Rock, is touring China.